This document collection intends to complicate common understandings of Indian removal that focus almost exclusively on the Cherokee history and experience. 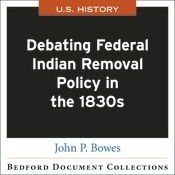 Through careful analysis of the documents, students will learn about the principles grounding the arguments made by Americans for and against the removal policy, even as they gain a glimpse into the different strategies used by Indian leaders to resist or influence the implementation of that same policy. Students are guided through their analysis of the primary sources with an author-provided learning objective, central question, and historical context.